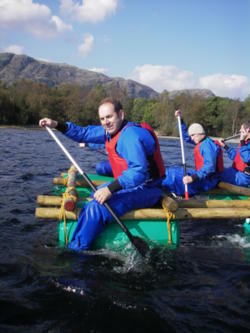 Using long rafting spars (wooden poles / planks), Barrels and lashings (length's of ropes) your team will build a raft capable of getting you around a set course on the lake. To start your raft building session your team will first plan out you raft design on paper and then make a scale model of the raft before building your final design. Once you have designed your raft you will then move on to building it using ropes to lash the spars and barrels together. If your lashings are loose and your raft isn't built correctly your in for a wet session. team will be on hand with safety cover to rescue you and your raft if needed! 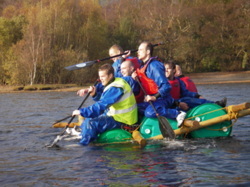 Raft building is an excellent activity whether it's for a fun session on the water or for a team building excersise. 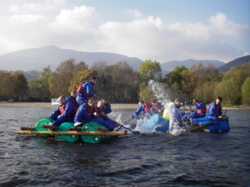 We have many raft building venues in the Lake District within easy reach of Chorley, Preston, Blackburn, Bolton, Rivington, Anglezarke and Manchester and in Cumbria, particularly around the North, South, East and the West Lake District areas, for example Coniston, Ambleside, Windermere, Keswick, Hawkshead, Kendal, Bowness, Ullswater to name just a few.